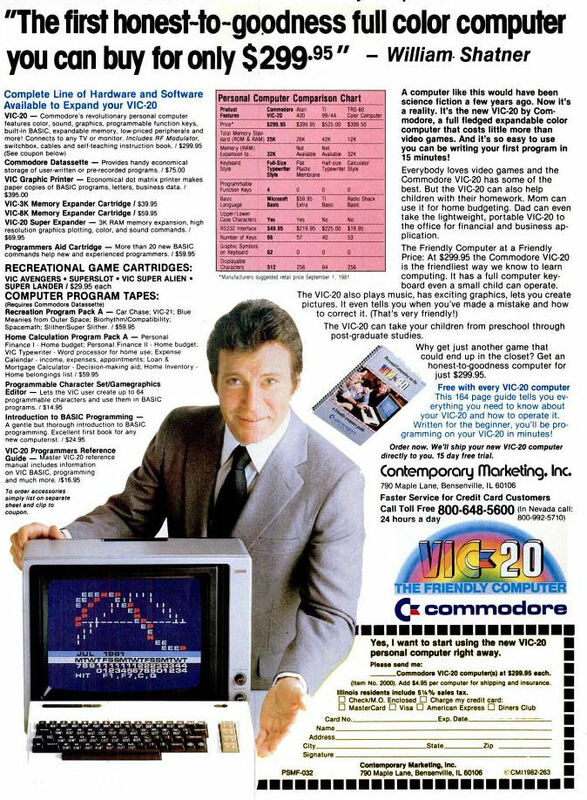 Captain James T. Kirk (William Shatner) sells Commodore VIC/VC-20 - amazing ! I got a Sharp PC-1500 last week and I liked it, especially the possibility to use Z80 machine code (exception: status register usage is different). That's very easy, because even if you just have the basic device without anything else, you can use the BASIC commands PEEK, POKE and CALL (you should have an Assembler on a PC but you can dump the binary code so you can "POKE" all bytes into memory). Also, it's easy to transfer program binaries to the device with the help of a PC... you can play previous recorded WAV files with a sound card, and connect the cassette interface to the PC's audio output. But it's also possible to convert the files to real binaries (e.g. for disassembling). At the moment I am looking for the interface, PC-1500 accessories are much easier to obtain compared to the previously introduced PC-1211, so it should not take too long to get it. It's a bit bulky, but this doesn't matter ( it's still smaller then a modern Netbook ;-) ). A specialized web site is http://www.pc1500.com/ ... a lot of software downloads are there. The later PC-1600 was 100% Z80 compatible due to the additional build in SC7852 (=Z80) CPU. ... which has two 4-Bit CPUs (!) from Sharp, SC43177 und SC43178 labeled, driven with only 256 KHz (yes, KILO not MEGA). This was my first "Computer" I had, and I loved it, because I was able to use the Pocket Computer at school (think about an electronical cheat sheet) also. Unfortunately it had only 1424 BASIC steps (implemented with 3 4KBit RAMs.... still wondering how this could work), so not too much for larger projects. Remarkable also is the rare yellow LCD display (later this intensive yellow color can't be found anymore). One of the successors of this first Pocket Computer was the PC-1500, which owns - guess what - a Z80 compatible CPU - perfect to program it also in assembly language. See also at vintagecalculators.com for more info (link below). I've created a page about transfering files from a PC to an old CP/M computer (e.g. my Kaypro IV) at http://www.z80.eu/transfercpm.html . But I forgot to mention how to get able to use or prepare a PC. I took my (mentioned in a blog entry before) Compaq Portable II to use Uniform for the file transfer on CP/M diskettes. This works really reliable and flawless. My old Compaq Portable II didn't has Internet access (of course not). The newer Quad Core PC is "legacy free", means no serial, no parallel port, and of course no diskette drive. The ideas about connecting my modern Quad Core PC with the old Compaq Portable via network (cable) doesn't work, because even if you want to use NETBEUI protocol (instead of TCP/IP) on a Windows XP PC, this is not easy (problematic protocol installation). Best and most success bringing way: Take a virtual machine (e.g. Virtual PC or VMWare), install MS-DOS 6.22, MS-DOS Addon for Workgroups OR Netware Lite, and do NOT try to integrate such old network protocols on your modern PC. Then try to install MS-DOS Addon for Workgroups OR Netware Lite also on your older PC (e.g. my Compaq Portable II). Even the above described solution is not running reliable. So I decided to take a much more simpler approach. I buyed on Ebay a Parallel Port driven CD-ROM drive (Freecom Portable), installed the MS-DOS drivers on my old Compaq, and 'voila' I was able to access (data) CD-ROMs on my Compaq also. Burning a CD/RW or a CD-ROM is much easier nowadays, and I have the data always online, even if my modern PC is OFF. Also, I can directly access my Walnut Creek CD, too. Most innovative, with a Gas Plasma Screen, really portable. My favorite portable PC here - NUMBER 3 ! WHAT'S YOUR FAVORITE ONE ? Got a (rare) C64 COMAL 80 cartridge !